Lightweight, low profile and robust paired with 4-wheel drive pickups these hard-side campers can be easily used for Off-Road adventures. 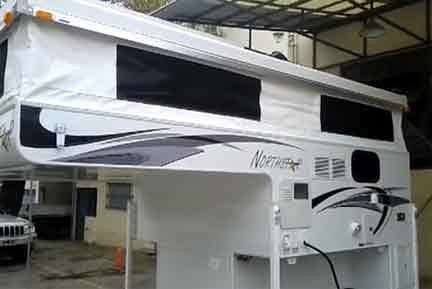 These intriguing campers are quite a bit different than a traditional Hardside, solid wall camper. They’re lightweight to save you fuel; their low profile significantly reduces wind resistance; they have a low center of gravity; and they’re so comfortable drive it’s almost like driving a car. The Four Wheel Camper Grandby model is very simple to set up. In one demonstration it took very little more than 15 seconds for one person to physically raise the roof and lock it in place. The thin little portion that overhangs the cab is the size of a double bed if you don’t extend it. If you choose to slide it out, it becomes a queen size bed! The design includes a two burner propane stove, a stainless steel sink, and an optional three way fridge. The exterior connections are typical for your LP Gas, electrical connection, and fresh water filler. The unit is not entirely self-contained because it has no internal grey water tank. Instead it has a connection on the exterior, and by way of a short hose, it attaches to an external 5 gallon grey water tank which you can empty at an appropriate facility. It comes equipped with a porta potty, or as it’s known popularly by campers, a cassette toilet. The reservoir on the toilet is 5 gallons. As we all know one gallon weighs approximately 8 pounds. If you allow the tank to fill completely, you’re going to have to carry 40 pounds. If you’re not up to that you should empty it frequently at an approved disposal station. For your convenience on the exterior there are fold down gadgets that can function as handles when needed, but are really steps so that you can get access to the roof rack in case you want a carry some extra goodies on top. The Northstar TC650 pop up possesses a lot of overall similarities to the Grandby, however it has a couple of clever variations. One is that the roof can be raised with a surprisingly easy to turn crank, again in just a few seconds, but you have to leave the door open while you’re raising the roof so that air can enter. When you’re lowering the roof you must close the door, and turn on the powerful exhaust fan in the ceiling because this draws the soft walls inside as the top descends, simplifying the operation. The Grandby, on the other hand, relies on bungee cords, which while perfectly functional, just aren’t as “cool” as the fan-method. The TC650 also comes with an exterior panel that folds out, creating a child or pet sized sleeping space or simply additional storage room while you’re stopped. It’s rated for up to 500 pounds so a couple of kids would be fine. The dinette converts to an additional bed as well. There is no shortage of room to put your head down. Another useful feature not mentioned with the Grandby is a stock furnace to keep your living space warm. The TC650 provides a space for a porta potty but it is not included. It does come with some prettier features such as a glass top stove, a glass top sink, and it does have a 7 gallon saddlebag style grey water tank. The three way fridge is stock as well. 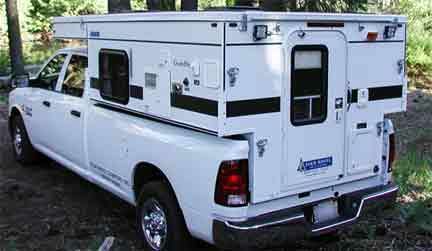 More and more people are using pickup trucks for their daily transportation and these pop up hard-side campers are even light enough to go on ½ ton truck. They can fit on an F150 extended-cab short-bed with minor adjustments. These items are light, convenient, economical, and if you really need two, you can still tow something with your truck while the camper is installed. These will be the wave of the future for Off-Road adventure holidays.